For device manufacturers, independence and implementation costs are the most significant considerations. For implementation, all costs for license fees, software stack, conformance test and certification were taken into account in the comparison. So was the complexity of each technology and its impact on the required resources and costs for implementation. 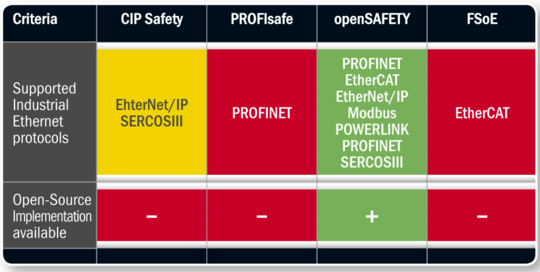 ProfiSAFE and FSoE are limited to the protocols of their user organizations. This could lead to the requirement to implement several safety protocols if equipment using different automation systems and fieldbuses is combined. CIP Safety requires the implementation of a dedicated CIP Abstraction Layer within the Black Channel, thus increasing engineering efforts. Acccording to our researches a FSoE slave is under development, but currently there is no certified FSoE slave stack available on the market. This may pose a potential risk for safety technology implementations on the device level. 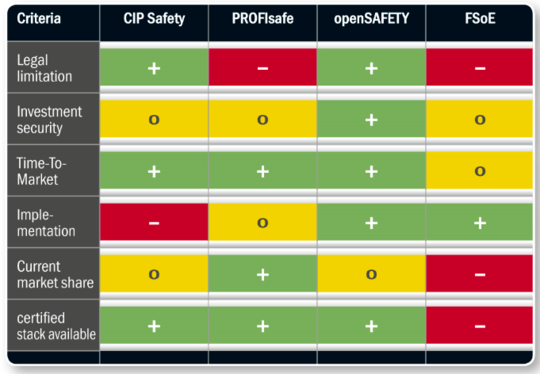 The openSAFETY stack is currently the only open source software for safety communication. Technically as well as from a legal point of view, openSAFETY is entirely technology-independent.